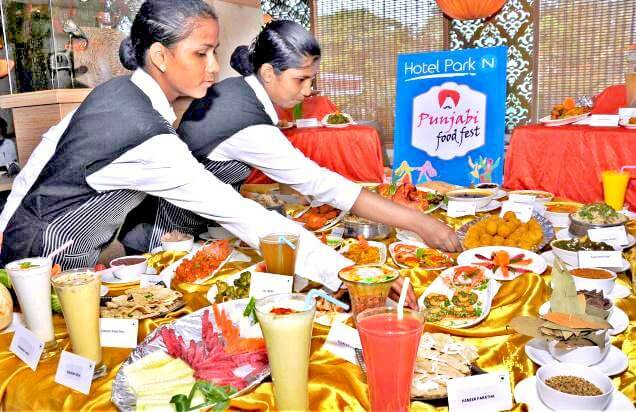 Punjabi Food Festival has kicked off in Hotel Park N, Near NTR University in Vijayawada. This is going to be a 20 days long food festival. This is launched on the marking of Baisakhi Festival, celebrated in Punjab and Haryana. The Punjabi dishes includes Shorba, Saaj, Lassi, Akbar mutton murg, Punjabi dum ka murg, Punjabi tikka biryani, Achari fish biryani, Lassoni jhinga curry, Barson ka saag, parathas, kulfi falooda and various other non-vegetarian and vegetarian dishes. The restaurant also offers to home deliver the dishes without any delivery charges, on phone order to locations within five km radius of the hotel.